I have spent the Labor Day weekend so far cleaning house instead of catching up on season 2 of Revenge, or reading a favorite romance novel over again (for the fourth time) out on my patio. Yes, cleaning house; a thankless job with an endless loop. It is therefore appropriate that I came across the first of two postcard messages. I wonder why the sender was in a hurry? It could be as simple as wanting to get the “wash & scrub” over with as soon as possible. I can certainly sympathize with the lack of summer comment. Today was a beautiful day – sunny, no rain, low 70s, and non-humid for once. I’ll give you 3 guesses why I spent not a minute outside enjoying it, and the first two don’t count. 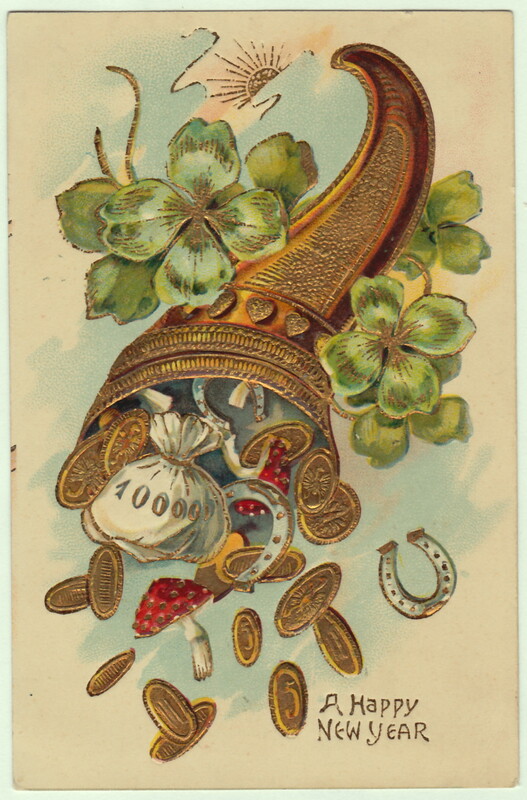 1910 Antique New Year Postcard – Overflowing Lucky Coins, Mushrooms, Horseshoes. The phrase “starvation rations” caught my eye. I plugged the phrase into bing. I learned “rationing”, and “making do” weren’t new concepts to the 1940s. Rationing also occurred in the first decade of the 20th century. With the lead-up to World War 1, food was being diverted to feed soldiers. Immigration to the US was on the rise. 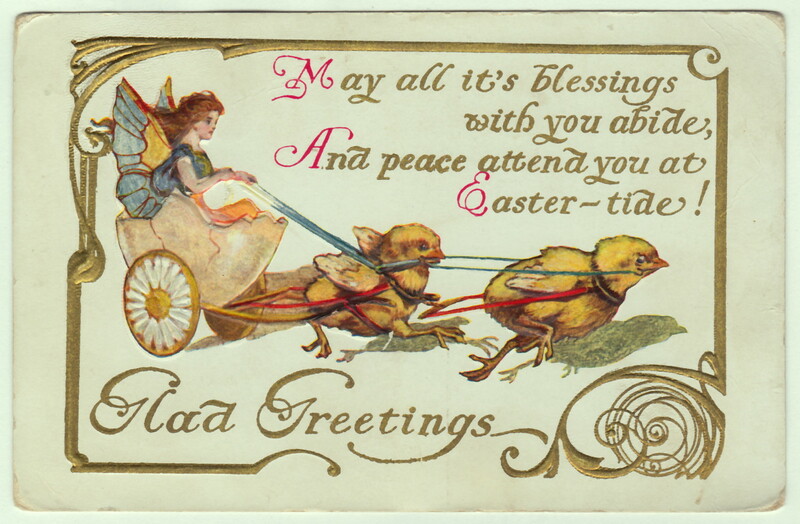 Let us hope Fannie was no longer on starvation rations when she received the above antique postcard. 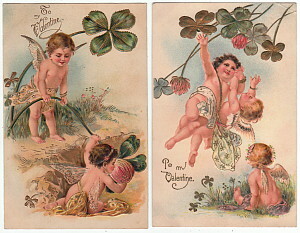 Both postcard messages did without something – freedom to enjoy summer or leisure time in the first message, and food in the second message. How sad. I read the above antique postcard message recently, which mentioned giving up football. I know a little of how the writer must have felt. Professional football has just started, and already I can’t wait for the humiliation to be over with. My team, the Vikings, are 0-2 so far this pre-season. OK, I’ll admit it. I’m a fair weather Vikings fan. Maybe I’ll change; maybe not. I don’t think the writer would’ve been a fair weather fan though with an attitude of “we fall or they fall”. 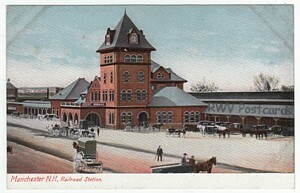 The above message also mentioned a certain female someone asking after Mr. Harry Harrison of Toledo, Iowa – the recipient of the antique postcard. Her name wasn’t mentioned, so we can only assume Harry knew whom the writer was referring to. Let’s hope his bubble (romantic?) wasn’t busted when the writer explained all regarding that female someone. I tend to think not as she cared enough to ask after Harry. 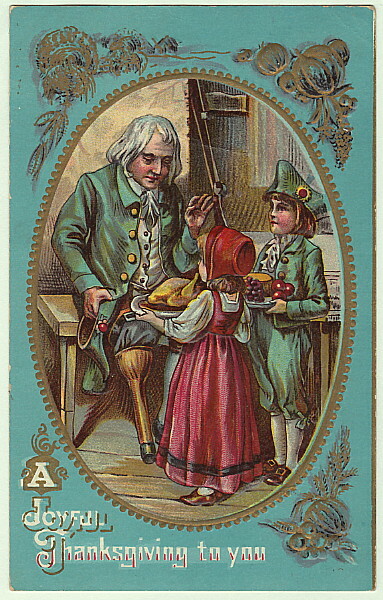 Antique thanksgiving postcard. 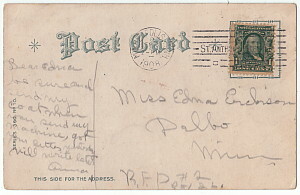 Postmarked 1911, Kelly Station PA. 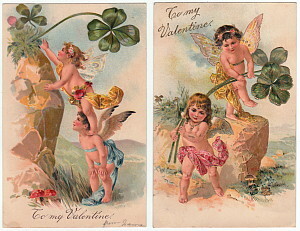 According to folk tradition, a woman was granted the privilege of proposing marriage to a man, instead of the other way around, only during leap year. If the man refused, he owed the woman compensation in the form of a gown and kiss, or gloves – provided she was wearing a scarlet petticoat. Sounds vaguely like the tradition of the Sadie Hawkins dance. The “ladies privilege” tradition explains the reference to “getting John”. Poor John. I don’t think the socially acceptable venue of a church party will help John. I hope he had an account at the local millinery (clothing) store.